Tasha, Rodney, and Octavia each share the same wish: to be accepted. But reality soon crashes into their world, bringing with it fear and confusion. Children in their class are being kidnapped. Suddenly, popularity and recognition don't seem so important. Making it home safely through the menacing streets of Atlanta is an everyday challenge. Even their parents are unnerved by this violent outbreak. Who will protect these children now? The convincing characters, voiced by a full cast of narrators, make this a haunting and effective work. Leaving Atlanta confronts complicated and sensitive subjects with just the right amount of sorrow and promise. The best reviews that I read do not answer silly questions like, "If you were to make a film of this book, what would be the tag line be?" Why does Audible do that? Leaving Atlanta is a wonderful collection of stories set in a tragic situation. The main characters are all fifth graders and the author deftly draws out the character of each one. They are as rich as a fifth grader can be and marvelously real -- worrying about the superficial things that are so important to a 10 year old, while also worrying that tomorrow that may be killed by a faceless murderer. The author's attention to details make the story all the more real. I strongly recommend this great piece of fiction surrounded by historical truths. I was born in 82. This was news to me. My mom grew up in SC and intimately remembers this. The story is broken up into three segments. Enjoy them all but Octavia's was the best. The narrator for her was excellent. Tayari gave a realistic glimpse in what it felt like to be a child during that time. 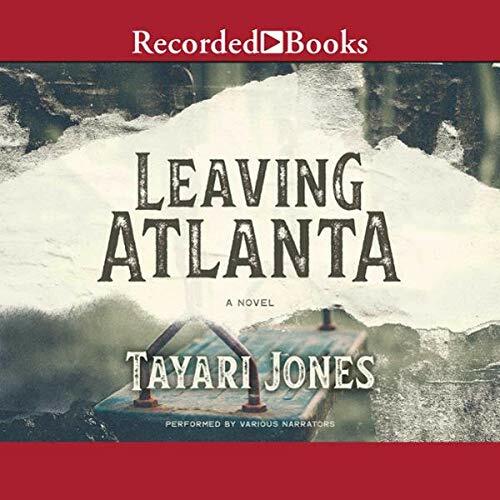 Where does Leaving Atlanta rank among all the audiobooks you’ve listened to so far? Wow. Tayari Jones is perhaps one of the best modern writers. She brilliantly captures the way a child views the world around her. I was blown away. What was one of the most memorable moments of Leaving Atlanta? What does various bring to the story that you wouldn’t experience if you just read the book? Fantastic book and audio production. I loved this book, and especially loved it on audio. The book is told in three parts with each part having a different narrator. I loved the way that this was done. The first part was told by Tasha, the second by Rodney, and the third by Octavia. I loved Tasha’s section the best and Rodney’s the least, but even he grew on me until I couldn’t help but really feel for him and care about him and his story. The three lives are intertwined in more ways than they realize at first, and this becomes more clear as the story progresses. Through the work we learn more about the awful spate of child murders that plagued the black Atlanta community from 1979-1981. Through the murders of the black children Jones is able to explore the racism and injustice that was faced still in the southern states in the 1970′s. Very glad I listened to this one. Tayari Jones always portrays characters so well. I love to read her books. The topic of this book is especially sad, even more so because it describes something that really happened. So, with the sadness of coming to the end of a good read and the subject of the book, pick this book when you're feeling upbeat. It is a good book. I'm glad to have discovered this good author. Jones is able to capture the true nature of how Black children speak, think, and play. Excellent book. Overall good book, writing, characters, but the story is pretty sad. It is reality though and based on a true story with characters that are fictional. I have listen to two Tayari Jones’ novels now and I cannot wait to download the next! Excellent! Narration was beautiful!!! Rodney was supposed to be understandably awkward but it didn't have a good flow. Story was also awesome but the ending was disappointing.